There’s no rule that dictates an intimate dinner is best enjoyed at home. An unexpected setting and the pleasure of being served holds special allure. Even better—why not a meal prepared by a favorite chef? It’s an idea that appealed to fashion designers and cofounders of Marchesa, Georgina Chapman and Keren Craig, above, as they planned a celebration dinner in New York. A dining room in the Upper East Side’s Crown restaurant would be their red carpet, with the table dressed in pieces from their own couture tabletop collection—Marchesa by Lenox—for a color-saturated setting that struts with unforgettable attitude. In the paneled dining room of Crown, the two style setters fashioned a table for eight near the fireplace. Experts in draping beautiful garments on famous bodies, Georgina and Keren designed a multilayered look for the table that started with two tablecloths: a gray-and-white hand-blocked print to match the napkins and an overlay of white linen. They continued the layering using two alternating colors of their delicately patterned bone china placed atop silver trays at each setting. The “Empire Pearl” dinnerware they chose “was a collection created to emulate the embroideries we use on our garments,” explains Georgina. 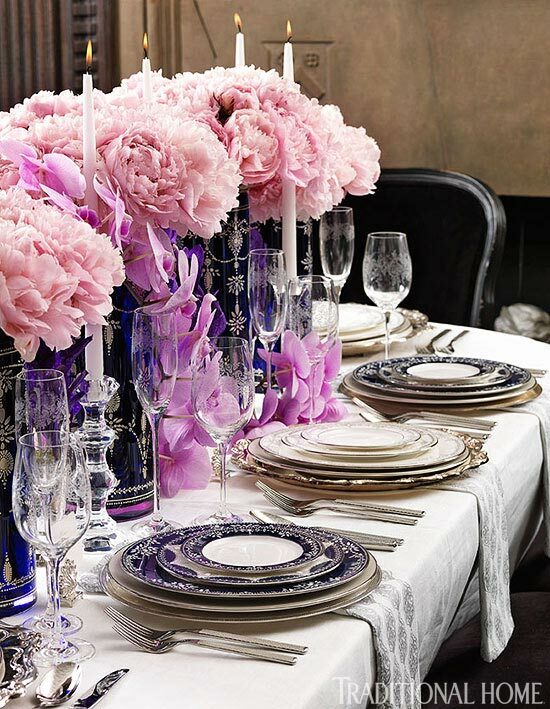 As with a runway event, where accessorizing can make a difference, the table’s centerpiece of cobalt-blue Italian glass vases filled with pink peonies and trailing strands of fuchsia Phalaenopsis orchids offers a striking embellishment. Matching motifs on vases and china add to the charm of the arrangement. 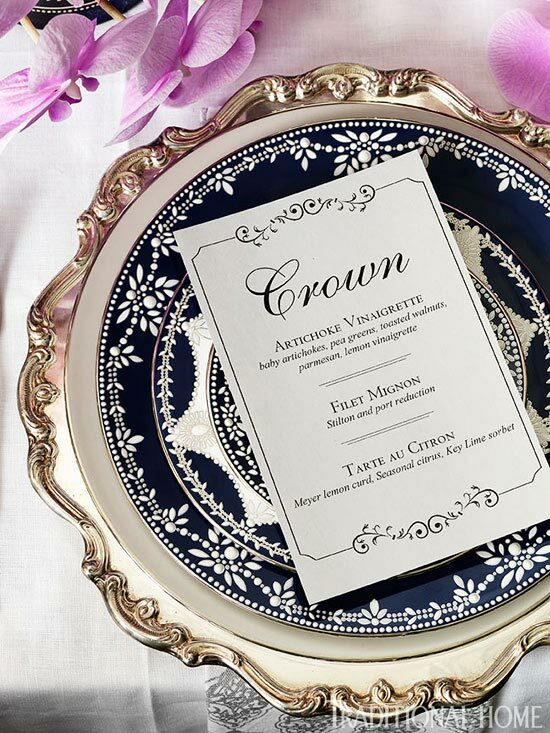 For visual variety, Georgina and Keren alternate place settings of Marchesa’s “Empire Pearl” bone china in indigo and white. The platinum motif—inspired by intricate bead detail on their fashions—is also etched on cobalt-blue art glass vases from Italy. “Paisley Bloom” goblets are classic in a subtle etched pattern. 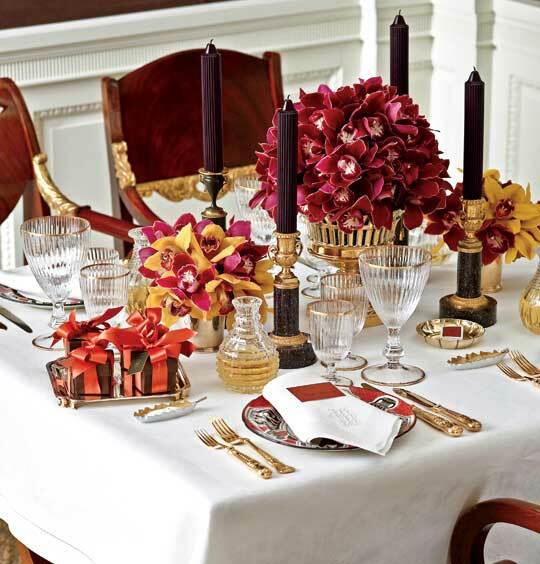 Lighted tapers in “Gossamer” crystal candlesticks illuminate the arrangements. All items available from Lenox. Flowers are by Jacqueline Elfe of Stellar Style Events. “Cartouche” hand-blocked cotton napkins from John Robshaw. 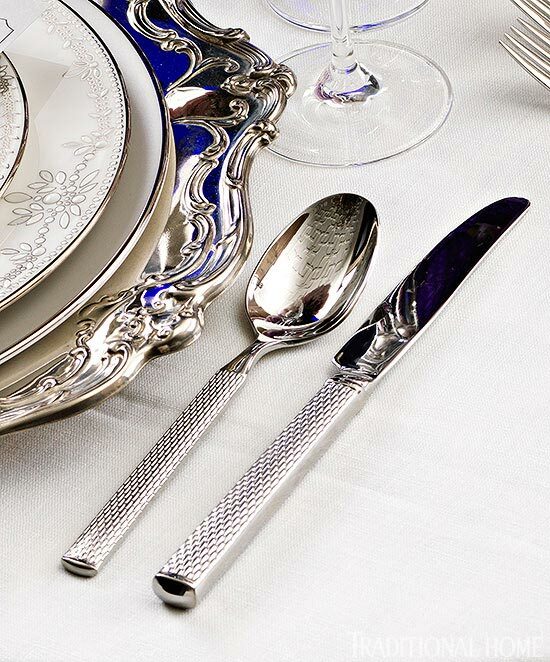 For special occasions, choose flatware with a pattern that reflects light, like the “Braided Opulence” stainless flatware by Marchesa for Lenox. Its design references the shimmer of beadwork that Georgina and Keren might use to festoon a ball gown. To achieve an extravagant attitude, indigo-blue “Empire Pearl” plates with raised enamel accents are anchored by basic white “Federal” plates—both at Lenox —and vintage Gorham sterling trays. Linen tablecloth by Sferra. 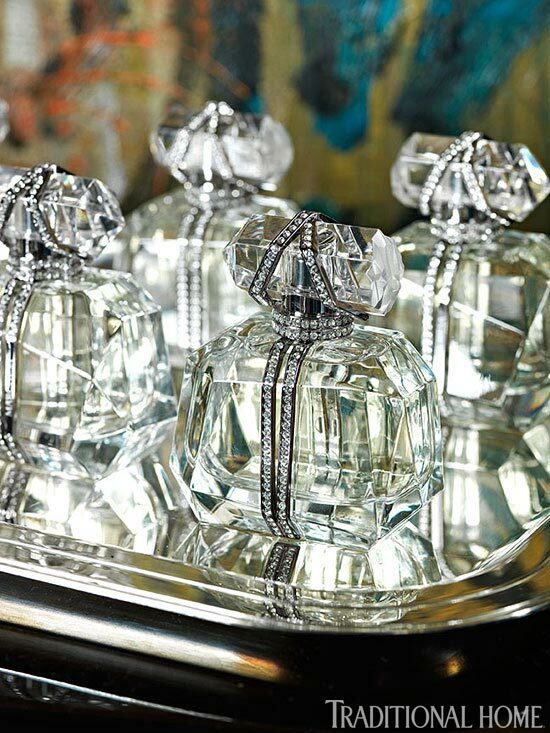 Bottles of Marchesa’s signature fragrance, Parfum D’Extase—available from Sephora—make stunning gifts for guests. 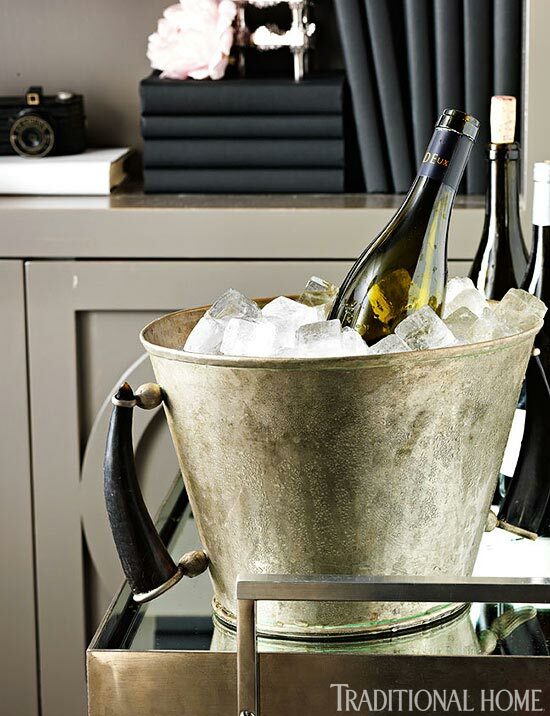 The chunky crystal vessels embellished with Swarovski-studded ribbon epitomize the romance of the occasion. Shiny polished silver seems elegant and formal, but maintenance can be time-consuming. Rethink the aesthetic of the table and consider the benefits of using vintage silver pieces that have tarnished to a timeless, alluring patina. 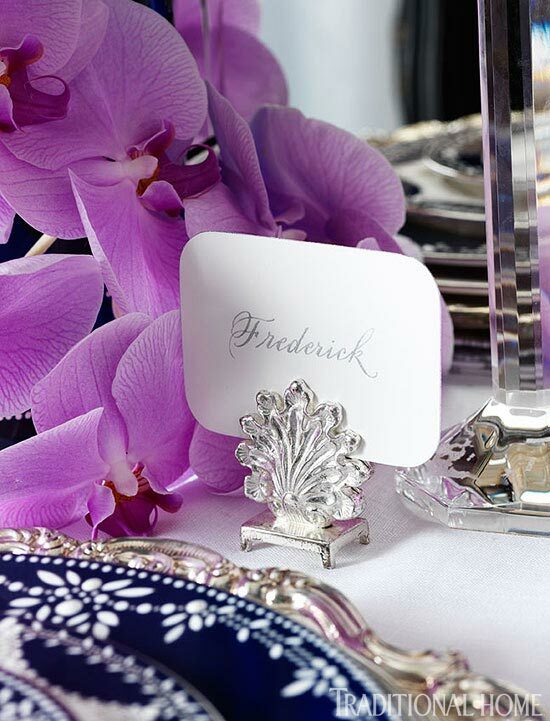 To complement vintage sterling silver place-card holders rendered in the form of an ancanthus leaf, elegant silver-ink calligraphy artfully adorns simple white cards softened with rounded corners. Calligraphy by Deborah Nadel Design. 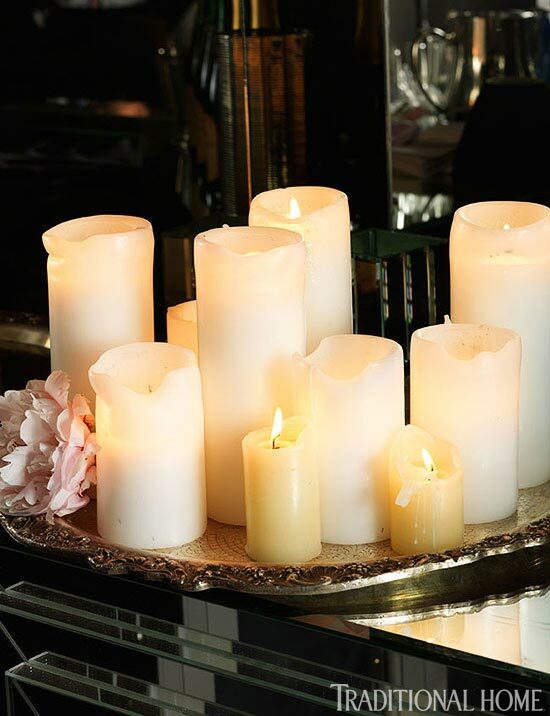 Nothing provides ambience like candlelight, so Georgina Chapman and Keren Craig assembled an assortment of ivory pillar candles in varying heights and arranged them on a silver tray. They suggest burning candles prior to a party to give them soft and shapely silhouettes. You don’t need to attend a ball to enjoy this menu from Crown restaurant in New York City. Chef/owner John Delucie and pastry chef Aleishe Baska have shared their recipes with us. Fill very large bowl with water. Juice lemon halves; add juice to water. Reserve lemon halves. Remove tough outer leaves of artichokes. Trim pointy tops and stems, rubbing artichokes with lemon halves. Transfer artichokes to lemon water as you work to prevent discoloration. Cut larger baby artichokes in half lengthwise, if desired. Drain artichokes. Transfer to very large skillet; add chicken stock, wine, and 1/4 cup oil. Bring to boil. Reduce heat; simmer, covered, 15 minutes or until artichokes are tender, stirring occasionally. Uncover; cook and stir over medium-high heat 5 minutes more or until liquid has evaporated and artichokes begin to brown. Transfer to large bowl. 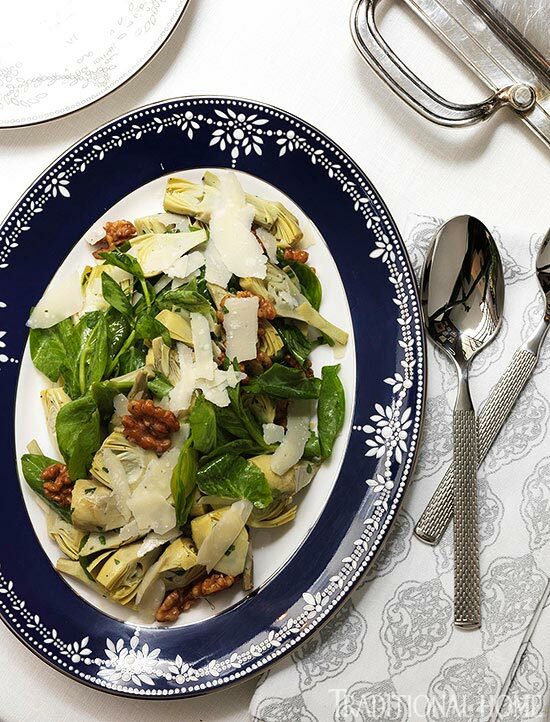 Add arugula, Parmesan, and walnuts. Toss to combine. Season to taste with salt and pepper. Transfer to serving platter. Drizzle with remaining 2 tablespoons olive oil and serve immediately. Makes 8 servings. *Tip: If baby artichokes are unavailable, omit soaking step. Use 4 (8-ounce) packages frozen artichoke hearts. Bring to boil with stock, wine, and oil. Reduce heat and simmer, covered, 6 minutes. Drain and proceed as above, omitting browning step. **Tip: A vegetable peeler is perfect for this. 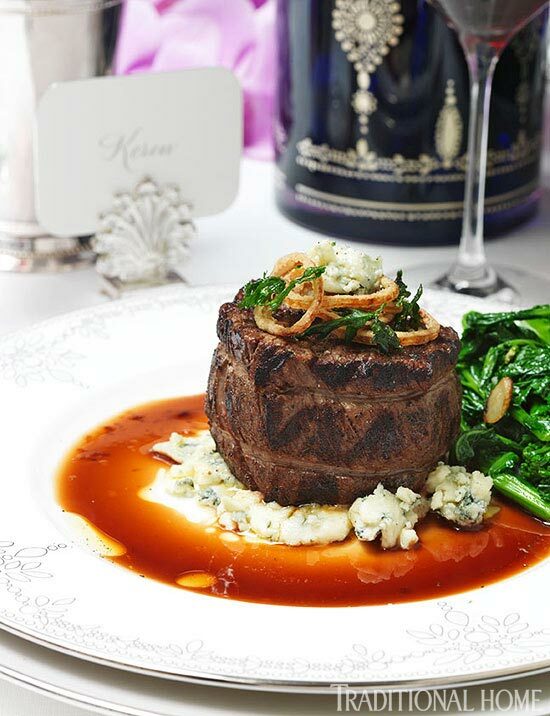 The classic combination of Stilton cheese and port becomes the accompaniment for this impressive main course. Ask the butcher to tie the steaks so they are 2 inches thick. Preheat oven to 425°F. Line 15x10x1-inch baking pan with foil; set aside. Season steaks on both sides with salt and pepper. In large skillet heat 2 tablespoons butter with olive oil over medium-high heat. Cook steaks, half at a time, until browned on both sides, 3 minutes per side. Transfer steaks to prepared baking pan. Repeat with remaining steaks. Bake 20 to 25 minutes for medium-rare doneness or until an instant-read thermometer inserted near center registers 145°F. Remove from oven. Let steaks stand 5 minutes. Meanwhile, heat same large skillet over medium heat. Add shallots and garlic and cook, stirring, for 30 seconds. Remove skillet from heat. Add port to deglaze; stir, scraping up browned bits from bottom of pan. Return to heat; bring to simmer. Simmer, uncovered, until reduced by half, about 2 minutes. Add beef stock; simmer, uncovered, until reduced by half, 8 to 9 minutes. Add butter to skillet, 1 piece at a time, whisking until fully melted and combined after each addition. Remove skillet from heat as necessary to prevent sauce from breaking; sauce should be thick enough to coat back of spoon. Remove sauce from heat; cover to keep warm. Serve steaks with sauce. Crumble Stilton over steaks. Sprinkle with parsley. Makes 8 servings. Tip: Serve with French fried onion rings. Wash broccoli rabe; remove and discard woody stems. 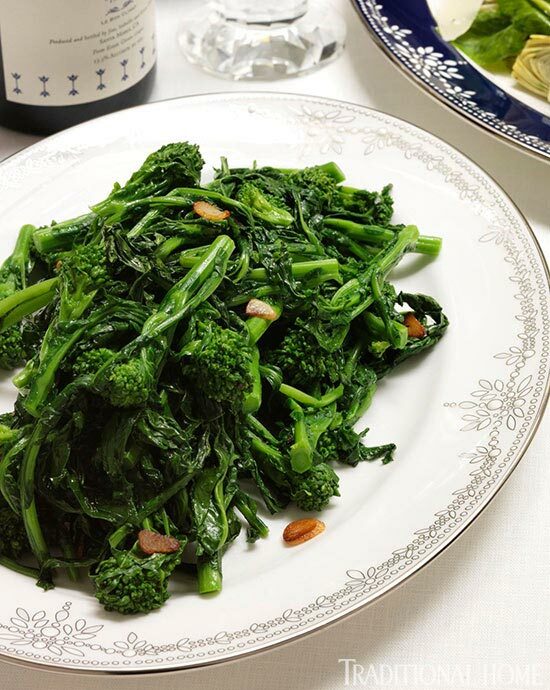 In large pot cook broccoli rabe in lightly salted boiling water 5 minutes or until just tender. Drain. These lovely individual tarts can make their appearance any season of the year—simply substitute whichever of your favorite citrus fruit is in season for the garnish and purchased juice for the blood orange juice. The shells, Myer lemon curd, and blood orange gelée can all be made a day in advance. Follow the directions for softening the chilled gelée when you assemble the tarts. In medium bowl beat butter with electric mixer on medium to high speed for 30 seconds. Add powdered sugar and salt; beat until smooth. Add egg; beat until combined. Beat in as much flour as you can with mixer. Stir in any remaining flour with wooden spoon. Wrap dough; chill 1 hour or until easy to handle. Place dough between two sheets of parchment paper. Roll to 1/8 inch thick. If necessary, chill rolled sheet of dough until firm enough to handle. shells. Place on large baking sheet. (Cover and chill any remaining dough for another use.) Bake tart shells 15 minutes or until lightly browned. Cool on baking sheet on wire rack. Remove shells from pans. In small bowl sprinkle 1/2 teaspoon gelatin over 1 tablespoon cold water. Let stand 5 minutes. In small saucepan combine blood orange juice, corn syrup, and 2 tablespoons granulated sugar. Bring to boil. In small bowl combine remaining 2 tablespoons sugar and 1-1/2 teaspoons gelatin. Whisking constantly, slowly pour sugar mixture into boiling liquid. Continue to boil, whisking constantly, for 1 minute to dissolve gelatin. Transfer mixture to shallow bowl. Chill 45 minutes or until partially set. (You should be able to spread mixture onto plate, where it should hold its shape. If mixture thickens too much in refrigerator, place bowl of gelée into larger bowl of warm water and whisk until softened.) Spoon 1 to 2 tablespoons of partially-set mixture onto center of 10 salad plates. Using small offset spatula, spread mixture on each plate. Cover plates; chill until gelée is firm. In small heavy saucepan melt white chocolate over low heat. Using pastry brush, lightly coat inside of each baked tart shell with thin layer of melted white chocolate. (This will prevent any moisture from lemon curd from making tart shells soggy before serving.) Let stand until set. (To speed process, place coated tart shells in refrigerator for a few minutes.) Spoon curd into each prepared tart shell. Use small offset spatula to smooth top of lemon curd to edges of shells so it forms an even surface. 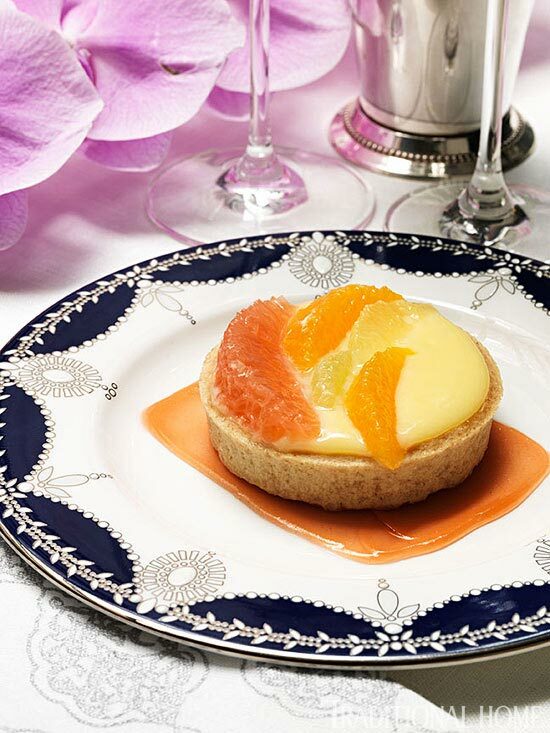 Decorate top of each tart with citrus segments. Place tart on top of gelée on each plate to serve. Makes 10 servings. Tip: If you do not have 10 tart pans, bake as many tart shells as you have pans for. Cool slightly and remove shells from pans. Bake remaining shells. Once tart shells have cooled, they can be tightly wrapped and stored overnight until you’re ready to use. See how another celebrated fashion designer—Carolyne Roehm— entertains in her own Manhattan apartment.